One of the problems of dog owners, especially those who have large breed dogs is they eat too fast. They gulp down the food without pausing, and they may inhale the food, which can cause them to choke. This kind of behavior is bad for their health, and for you to avoid stress, it is now time to use a slow feeder dog bowls for your fur babies. It can modify your dog’s behavior when it comes to eating, and it will improve its digestive system. If you are thinking of getting one for your dog, we will give you a selection of the best slow feeder dog bowls where you can choose which one is the right for your dog. Rapid eating of you dogs can lead to a digestive problem, and no owners would want that. This slow feeder for your dog from Durapet can help you in slowing down the eating habit of your pet. 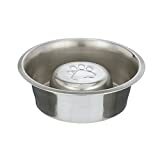 Made from durable stainless material, which has a bonded ring design to keep the food in one place, this dog bowl can help you when it comes to feeding your dog. It comes with different sizes depending on the size of your dog. For small dogs, it can hold up to 3 cups of dry food, for a medium dog up to 4 cups of food, and for large dogs is up to 8 cups for dry foods. 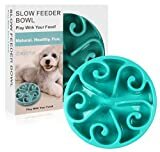 This next slow feeder bowl is not your ordinary bowl; it has a maze interactive puzzle design that also helps your dog to eat slowly and avoids getting bloated. It also promotes healthy eating, and overeating and that means this bowl is a diet bowl perfect for your dog. The special design of the bowl gives excitement, and challenge to your dog when eating, but it is fun. 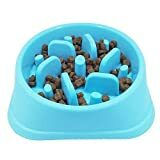 This type of eating bowl is recommended for small to medium size of dogs. It prevents food spillage and sliding since the bottom of the bowl has a non-skid. It is made from BPA-free, eco-friendly, and strong materials to ensure the quality of each bowl. The bowl can hold up to 1.5- 2 cups of food, which can help your puppy to eat slowly, and prevent them from bloating. It has a simple design like obstacles to prevent them from choking, and smooth surface design to avoid scratches to your puppy’s mouth and tongue. The outer surface is environmentally friendly abs resin and has a design for anti-knock. If you want your pet to slow down their eating habit and avoid choking, and overeating. Getting this bowl can be a huge help because it is safe and durable, and has a fun, and exciting design. It also helps your pet to have a healthy lifestyle, and prevent indigestion. 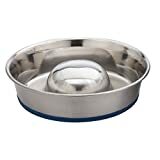 This bowl can prolong the eating time of your pet, which is very beneficial since fast eater pets are more prone to sickness and obesity. When it comes to price, this one is cheap, but it can be good as a gift since it has an individual package. This bowl is designed only for dogs, and this is not a cat bowl. Made from food-safe, high-quality ABS materials that are PBA, PVC, and Phthalate free this product is safe for your fur babies. This slow feeder dog bowl is good for your dog’ diet since it can slow their eating behavior. Rapid eating can cause serious problems, and with the help of slow feeder bowl, you can assure that your babies are safe eating their food. 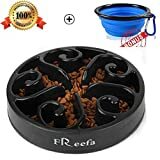 The unique design of the bowl makes the food go further, and your dog will feel full with a smaller amount of it. This is suitable for your pets that eat and drink quickly since it is designed to help your pet to slow down his/her eating, and drinking habits. With that, you can prevent obesity and digestive problem. Worry less with the feeder bowl that can hold up to 1.5 cups of food. The maze shape can hold food up to 1.5 to 2 cups of dog food. If you think that your pet is eating too fast, and too much a use of slow feeder bowl is a help. Made from heavy duty, non-toxic, and food safe materials that are good for your pets. The feeder is divided into two kinds of difficulty depending on the size of your pet. 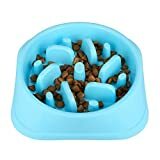 For a smaller dog, we recommend the easy version of the maze that can hold up to 1 cup of food and for larger dogs; you can get the bowl that can hold up to 1.5 to 2 cups of food. The typical 5 minutes eating time of your dog can be slow down up to 20 minutes. The design of this slow feeder dog bowl forces your dog to chase their food around the bowl, which leads them into slower eating time, and makes the dinner time more exciting. The materials used in making this bowl are stainless steel, shatterproof, non-toxic, and dishwasher safe. BPA free materials so it is safe for your pets. The good thing about slow eating is not only to avoid your pets from choking, and bloating, but this is also a way of dieting to avoid overweight dogs that can lead to diseases. The size of the bowl comes in medium, and large. For the medium one, it can hold up to 2 cups, and for the larger one it can hold up to 3.5 cups of dry food. This next item is perfect for medium and large dogs. There is a cute paw logo in the middle of the bowl, and the ring design is to teach them how to chase their food. This will help them eat slower than their usual eating habit. It is one of the most elevated feeders that can hold up to two quarts of food. Using this type of slow feeder can help your pet to prevent choking, and vomiting due to excessive eating. This 8.25″ in Diameter x 2.75″ Deep made from high-quality stainless steel. It helps your dog not only to stop rapid eating, but to lose weight since it can change the eating lifestyle of your pet, and make them full easily. When it comes to cleaning, it is dishwasher safe. If your pet is a fast eater, this dog feeder can be good for them. This will help you with your problem with canine obesity, regurgitation, choking, bloating, and promotes healthy eating. The items used in this feeder are food-safe ABS plastic and phthalate free, which means it is safe for your fur babies. The food goes further that is why the pet will feel full even though they only take a small amount of it. If you want a healthier and funnier mealtime with your baby, getting them with a slow, and fun feeder dog bowl would be great. Your dog can now eat slower, and better than before. Say goodbye to your worries because of their excessive and rapid eating habit. 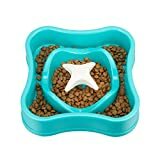 This next slow feeder dog bowl is cheaper compared to the other bowls. It promotes a healthy, and fun eating lifestyle to your beloved dogs. It can slow down the eating habit for up to ten times that can prevent obesity for dogs, and other health problems because of fast eating. The veterinarian also recommends this type of eating bowl to help the digestive system of your dog and to avoid bloating as well. The capacity of this container is up to 4 cups of dry dog food. Made from PVC, BPA, and Phthalate free materials you can ensure that your dogs are eating safely with safe containers. The smallest size of the bowl can only hold 3/4 cup of dry food, and that perfect for a smaller breed of dogs. The largest size is the one who can hold 4 cups. Our best slow feeder dog bowl is from Siensync. The price has cut off, and now it is cheaper than before. Made from good quality materials to ensure the safety of your pet, and makes the eating time more fun. 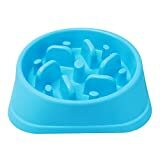 The design of the bowl gives fun and excitement to your pet when mealtime comes. It does not only slow down the way your pet eats, but it also gives a challenge that stops it from being boring. The slow bowl helps the owner to control their pet when they start eating fast. You can control the amount of food you can give to them, and still will be satisfied with it. This bowl can contain up to 2 cups of dry dog food. We know how dogs eat, and the food container will slide, and slide wherever it goes, and prevent that this bowl has a five little non-skid rubber at the bottom. This is not only good for dry foods, but it is also good for wet food, and water. Using this as a dog bowl will prevent your dogs from choking, obesity, and vomiting. We all want what is the best for our fur babies, and giving them the best slow feeder dog bowls is one way of showing them how much we love them. Pets are like family to everyone, and their health is important just like with the human. You will get worried, and stress if you notice something is wrong on your pet, that is why it is important that you take care of them properly. Giving them these slow feeders can benefit a lot, not only for them but also for you as an owner. One problem of dogs, especially those large breeds is their excessive, and fast eating habit, and good thing that there is a slow feeder to prevent, and control their usual eating routine. Of course, since there are tons of items that you can see on the internet, it will be hard for you to choose which is the perfect product to your dog. The items that we listed are not only tested but also proven the best slow feeder dog bowls that your dogs deserve to have. Some price may change in time depends on the store.